Hyperhidrosis is a condition that causes someone to sweat excessively from various parts of the body. There are many misconceptions tied to this condition, and here are some of the common ones that are absolutely not true. 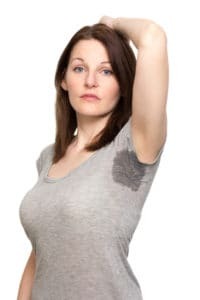 While there is no proven “cure” for hyperhidrosis, there are certainly things you can do to reduce excessive sweating. One of the best, safest ways to stop excessive body sweating is with iontophoresis treatment. This method involves sticking your hands and other body parts in a tray of water with light waves of electricity running through it. Iontophoresis works because it helps shut down your sweat glands. You can either do this at a clinic or buy the accessories to do it at home. Many people who try to reduce excessive sweating waste a lot of money on traditional antiperspirants. Most traditional deodorants don’t help that much to reduce sweating. They just cover up your body odor and mask it with a better scent. A prescription antiperspirant is your best bet to help reduce excessive sweating. Some people think that their hyperhidrosis will gradually go away with age. Unfortunately, this is not true. According to a recent IHS study, 88% of respondents said their excessive sweating either got worse or stayed the same over time. These results remain consistent over all age groups, from children to older adults. One of the only things that will help your condition subside is to undergo treatments. Some people think that they don’t have hyperhidrosis, or their friends don’t believe them, because the person is not always drenched in sweat. Hyperhidrosis patients’ sweat can range from severe dripping to moderate moisture. The symptoms can manifest themselves in many different ways. Excessive sweating can affect someone’s armpits, chest, back, face, feet, hands, or groin, and it can happen at almost any time. More than 90% of hyperhidrosis patients say that their condition affects their emotional state. In a recent survey, most patients said they feel less confident because of their excessive sweating. Don’t let these myths or your condition get you down. Contact us today to start your iontophoresis treatment and get your life back. Iontophoresis is a technique used to treat hyperhidrosis. It is most often used for the hands, feet, and/or underarms, but it really can be used for any part of the body. The process involves small electrical currents running through water. You can have the treatment done at a clinic, or right at home. If you want to try it in the comfort of your own home, here are some hyperhidrosis accessories you’re going to need. These trays are used to hold water as well as the electrode cable in place to ensure that the electrode plate remains in the center of the tray. It is also shaped to act as an armrest for those treating their hands or arms. It can still be used for treating feet. These trays are designed for maximizing comfort and ease of use throughout the treatment. These electrodes are used with iontophoresis machines for the ideal treatment of the hands or feet. They allow the cable connection to be used clear of the water in order to minimalize any discoloration of the equipment. The electrical currents necessary for iontophoresis treatment would not be possible without electrodes. Lastly, it’s a good idea to have towels for your treatment. You are putting parts of your body in water a few times a week, and you’re going to want to dry yourself off afterward. This is especially helpful if you have to squeeze in a treatment on your lunch break or in between social engagements, as the treatment only takes 10 to 20 minutes. The towels also provide a barrier to prevent skin-to-metal contact during the treatment. Iontophoresis was introduced more than 50 years ago as a method for treating hyperhidrosis. It works very well to prevent sweating as long as the treatment is performed frequently enough. When you start, it should be done two to three times a week, and then you can cut down to one to two times a week. Get yourself some of these hyperhidrosis accessories so that you can go on living your life without having to worry about your sweat. Excessive sweating can be extremely embarrassing and can be caused by a variety of factors. 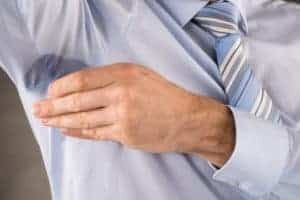 The most common cause of excessive sweating is hyperhidrosis, which affects between 1% and 3% of the entire population. However, there are many other causes of constant sweating that can be identified and mitigated. One of those causes can actually be your diet, and the types of foods you eat. 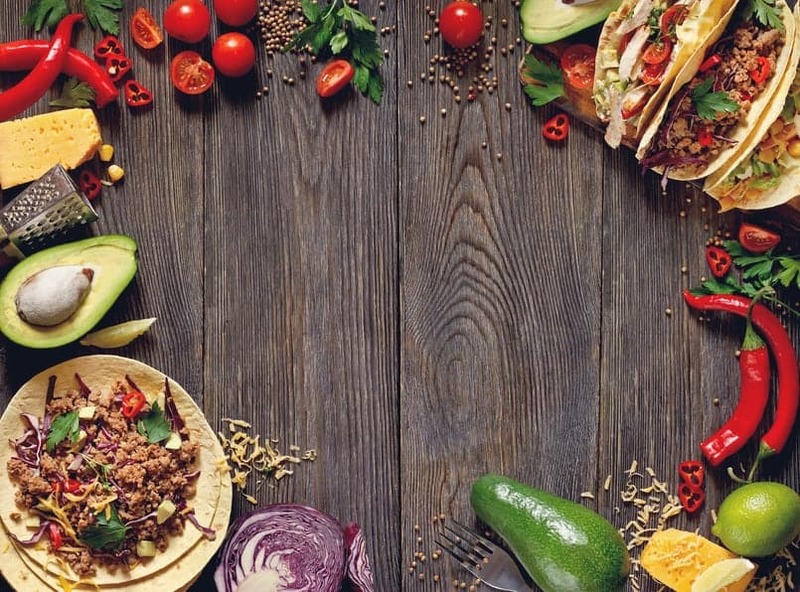 Here are four foods that can make you sweat uncontrollably. Not only will they cause you to gain weight and give you heart problems, but they’ll also make you sweat. These types of foods are harder for you to digest and break down, and so the body works twice as hard to process them. In doing so, your body creates energy which creates heat which then creates sweat. Chocolates, fast foods, white bread, donuts, and just about anything that tastes really good are contributors to excessive sweating. If you thought giving up fatty foods was hard, now you have to try to give up caffeine. Unfortunately, beverages that contain the magical go juice will make you sweat more. Caffeine is a stimulant and raises your heart rate and blood pressure. Basically, (as most of you know) it gives you energy. Like with fatty foods, energy naturally causes your body to heat up and therefore your sweat glands are activated. The reason why you might have excessive sweating might be as simple as too much salt. Even though there is no evidence to support that eating large amounts of salt can cause excessive or constant sweating, it probably doesn’t help. When your body has too much salt, it gets rid of it through urination and perspiration. Keeping your salt intake low could be just what you needed to control the excessive sweating. The concept behind this one is simple, but the actual science is a little bit more complex. The simple version: you eat something spicy, you get hot and sweat. The science version: spicy foods often contain a chemical called Capsaicin that actually tricks your body into believing that its temperature is rising. As a result, your body’s response system is urged into action, which is (you guessed it) sweat. The main pattern that seems to arise throughout all of these: keeping your body healthy. The healthier you are, the better your body will function. That means watching what you put into your body. So switch the burger for chicken or even vegetables. If you experience excessive or constant sweating, call us today to stop the sweat and take control of your life. If you find yourself sweating a lot, you might be afflicted with a condition known as hyperhidrosis. This a medical condition in which the sweat glands either overproduce sweat or never turn off. This causes a socially stigmatized constant sweating that can wreak havoc on the afflicted individual’s life. Luckily there is a treatment that can help you overcome this odd condition. Iontophoresis is a treatment involving electric currents conducted through water. Whichever body part is most affected is submerged in water, then electrodes are submerged in the same water. Though doctors aren’t certain what the exact mechanism is that makes this effective, it is effective all the same. So, how did iontophoresis come to exist? Even though iontophoresis was only introduced as a means to control excessive sweating 50 years ago, the concept has been around for much longer. Using electrical therapies, in general, was conceptualized in the mid 18th century, but it wasn’t actualized until the 19 century with work by five prominent doctors of the time. Until 1908, the term doctors and researchers used to describe any electrical current administered therapy was ‘cataphoresis’ when Fritz Frankenhäuser coined the name we know it by today. Though it never currently caught on in the mainstream medical world, iontophoresis has been successfully used as niche treatment ever since. Aside from excessive sweating, many people use inexpensive machines called TENS units (Transcutaneous Electrical Nerve Stimulation) for pain management. These electrical pulse creating machines are attached to a painful place on your body, and the pulse alleviates pain in many patients. The technology behind electrical pulse therapy machines is sound and has been used for many years successfully in a number of different medical situations. Whether you are in physical pain, or emotional pain from the prospect of sweating a lot in front of others, the relatively dated concept of electricity as a treatment has yet to go by the wayside. In fact, quite the opposite. Iontophoresis might take a few sessions to see the success that you desire, but you will likely see some strongly positive progress along the way. If you are interested in a method to control excessive sweating, talk to your doctor today about iontophoresis. If you are experiencing constant sweating, you might be affected by a medical condition called hyperhidrosis. 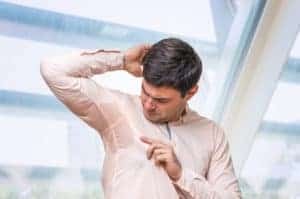 This condition triggers an over-activation of the sweat glands, making the affected individuals sweat uncontrollably regardless of the temperature. This condition can affect your armpits, face, feet, hands, or all of the above. Hyperhidrosis ranges from fairly minor to severe. If you have a severe case of hyperhidrosis and you are always sweating, it can cause problems in your daily life. In fact, 90% of patients afflicted with an excessive sweating problem report that it affects their emotional state. A survey showed that most patients reported diminished confidence as a direct result of their condition. Anxiety is all too common across America, but it is especially prevalent among those who have hyperhidrosis. One way to quell the symptoms of anxiety is to take a look at a cbd wholesaler for herbal remedies. Not only can excessive sweating cause anxiety, but anxiety can make excessive sweating even worse! So you might seek treatment that will help you learn how to stop excessive sweating for good, such as using cannabis maybe even smoked using a vape that is a common part of dispensary supplies. Here are some more tips to mitigate your anxiety. Be mindful of when you feel particularly anxious. For many in your position, other people noticing your condition can trigger it even more. If you feel a bout of anxiety coming on in the presence of others, take a deep breath. Pay attention to why you are having an anxious reaction rather than trying to ignore it. Mindful reflection can help many individuals with anxiety. Give it a try. Watch what you are eating and drinking. Stimulants like caffeine can cause both anxiety and an elevated heart rate. This can make your body warmer, which could act as a trigger for hyperhidrosis (although it doesn’t need to). Perhaps the most difficult thing to do if you’re always sweating is to acknowledge that your body behaves differently than others and that that is fine. You are no less a human being than the next person. All humans have a quirk about their bodies; some are visible, and some aren’t. Accept yourself, you’re great! While seeking treatment options that work, you still need to go about your daily life. Anxiety can make that a painful and debilitating experience. The above techniques have already helped many individuals to cope with their anxiety. Try them out while you try to find a treatment that works for you. It can’t hurt, right?